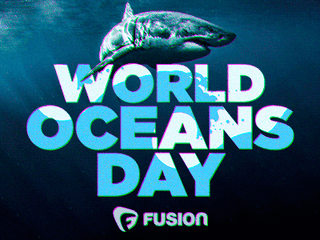 FUSION TV will commemorate #WorldOceansDay on Thursday, June 8 with a special day of programming and digital content from Project Earth, the network’s environmental unit. Project Earth launched two years ago and has since produced numerous documentaries for FUSION TV and published nearly 1,000 stories on topics ranging from shark conservation to national monument creation to the future of Alaska’s salmon fishing industry. With an emphasis on climate change, oceans, extinction, and politics, Project Earth sees and covers the environment as a social justice issue, seeking to inform and engage today’s generation about the biggest trends and happenings in the environmental space — check out more content here. Shark Tourism @ 10PM | In a new special report, FUSION explores one of the few success stories in the world of shark conservation: the islands of the Bahamas. FUSION TV’s environmental Correspondent Nicolas Ibargüen traveled to the Bahamas to explore whether ecotourism could be the key to saving the world’s sharks. Because of protective initiatives over the past quarter decade, the region’s shark populations have remained far healthier than in most of the world. And in 2011, the island nation became one big shark sanctuary, banning shark fishing in the surrounding waters. The Bahamas are now one of the best places on the planet to see sharks in their natural environment, which has naturally drawn a lot of shark tourism, which in turn has lead to more money and attention to shark conservation. Read more about the special report here. King of Seas @ 10:30PM | Great white sharks have long been depicted as dangerous man-hunting monsters. In this expedition, Project Earth dispels these myths by showcasing the true role of great white sharks in today’s oceans. Nicolás Ibargüen is joined by world renowned white shark expert Mauricio Hoyos as they explore Isla Guadalupe, one of the world’s top destinations to dive with the king of the ocean. Wet Dreams @ 8PM + 11PM | Discover what it takes to be a big wave surfer as we follow Rafa Tapia, a Chilean big wave surfer who is attempting to break the big wave world record in Nazare, Portugal, home to some of the world’s largest swells. Through his trials and tribulations the new documentary shows what it takes to conquer such a feat. MINI DOC - Off the Shelf: FUSION TV’s Year-Long Investigation Inside the Shark Cartilage Industry | A year-long investigation by Fusion’s Project Earth team has unearthed a trove of troubling evidence about the shark cartilage industry. Shark cartilage pills, which are taken as health supplements, have no known health benefits and research has shown that they may contain toxins and chemical properties that could be harmful to humans; and now, DNA testing has revealed that various brands of shark cartilage pills contained cartilage from an endangered species of shark, while other brands didn’t have shark cartilage at all, but rather DNA from other marine animals. After Fusion’s team shared their DNA evidence with the manufactures and retailers of shark cartilage products, two leading health stores in the U.S. announced that they had removed the product from their shelves and website. Watch the mini-doc and read the report here. How the Return of Top Predators Catalyzed Economic Growth Around This National Park | The story of a small marine park in the southern tip of Baja California, Mexico, is a beacon of hope for the world of shark conservation. Cabo Pulmo was once a rich reef ecosystem, replete with colorful fish and large ocean predators. But as the region’s waters were aggressively fished for much of the 20th century, the fish went away and local fishing communities suffered. Conservationists reacted by reaching out to the local fishing community, and in 1995 successfully lobbied the government to establish the Cabo Pulmo National Park, a marine protected area covering 27 square miles of Cabo Pulmo reef. Life came back to the reef, and with it a new tourism industry, which helped replace local jobs. Fusion’s environmental correspondent Nicolas Ibargüen traveled to Cabo Pulmo to explore how conservation can spur ecotourism, and ultimately help save the ocean’s top predators. Read the full report here.